liz, last night the Morton County Sheriff's office put Standing Rock water protectors in grave danger. Hundreds were injured, including an elder who went into cardiac arrest and several people treated for rubber bullet injuries to the face. They used projectiles that ripped through people's muscle tissue (warning: graphic photos). Police fired water cannons at the protectors for at least six hours in below freezing temperatures, exposing them all to hypothermia. Medical professionals at the camp called for a cessation of this tactic because of the real threat that people could die. 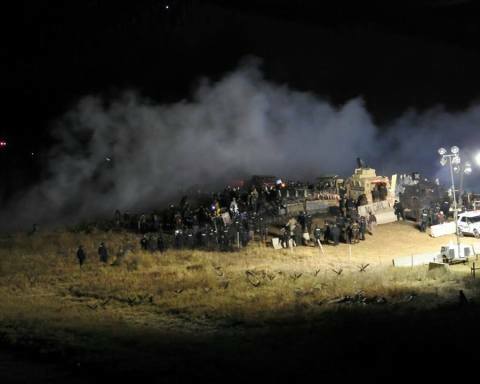 And Morton County law enforcement just kept drenching water protectors in water, tear gassing them, firing concussion grenades and using sonic weapons against them. This is inhumane! They are willing to directly threaten people's lives in order to protect profits for the oil industry. Enough is enough. Hello, my name is ___________. I am horrified by the violence used by your officers against the Standing Rock water protectors last night. It is nothing short of torture to douse people in water, in below freezing temperatures, for hours. People could die from this inhumane escalation. Your officers are willing to risk killing peaceful protectors. It's time to end these dangerous tactics and torture against the people at Standing Rock. After your call, fill out this form to tell us how the call went. Tell us how Morton County is responding to concerns that they are risking people's lives. Morton County law enforcement is already claiming that they were putting out fires started by the protectors, but several livestream feeds, including the one we followed all last night, show that the fires were started by Morton County officers and their tear gas and concussion grenades. Do not let them get away with telling this lie! Every level of government needs to hear from the people loud and clear that we will not stand for the torture of peacefully gathered water protectors, all in the name of oil money. If you have more time, we need you to make two more phone calls--To the Army Corp of Engineers and the Department of Justice. Click this link to view the phone numbers and scripts for each agency, as well as report back on your calls. These agencies have the power to stop all of this. We need to light up the phone lines of every official who is allowing law enforcement to torture people who are fighting to maintain clean drinking water and preserve their sacred sites. We cannot sit idly by while people are brutalized like this.